Haredi paratrooper company sworn in at Western Wall as requests to join unit continue to climb. 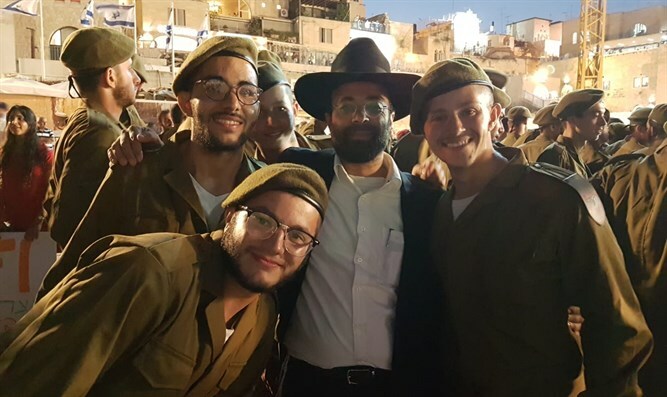 Over 50 haredi soldiers in the Paratroopers Brigade were sworn in last Thursday at the Western Wall amid a furor over the Conscription Law that threatens to topple the government. The haredi paratroop company, named 'Hetz', was the sixth draft class since the unit was formed in 2017 and its 50 new soldiers makes it the largest-ever recruitment cycle. Since its establishment, the Hetz's popularity has grown and the IDF plans on opening an haredi company in the Golani Brigade as well. The army also has the Netzach Yehuda-Nahal Haredi Battalion in the Kfir Brigade and the Rotem Company in Givati that is geared to haredi troops. As part of the special accommodations, female soldiers are not deployed on base, and soldiers receive special food that conforms to a stringent halakhic standard of Jewish dietary laws. "We are pleased with the success of the project to integrate haredim into the Paratroopers Brigade." said a rabbi from the Netzach Yehudah Foundation, which assists haredi soldiers throughout their service. "The soldiers of the Hetz company are proving that it is possible to serve in IDF combat brigades without compromising on a haredi way of life."